OAK BROOK, IL--(Marketwired - Nov 12, 2013) - In honor of individuals who have made outstanding contributions to improving the health and wellbeing of children, Ronald McDonald House Charities® (RMHC®) hosted its 29th Annual Awards of Excellence celebration on Saturday, November 9, in Rosemont, Ill.
Geoffrey Canada. For more than 30 years, this president and CEO of the Harlem Children's Zone® (HCZ), a community-based organization whose mission is to do whatever it takes to educate children and strengthen the community, has been publicly recognized for his pioneering work helping children access vital educational, social and medical services, and as an avid advocate for education reform. The New York Times Magazine called his work, "one of the most ambitious social-policy experiments of our time." Most importantly, the 12,300 children served annually through the HCZ are given the opportunity to thrive. Mr. Canada received the Award of Excellence. Henry B. Perry, III, MD, PhD, MPH. For the past 30 years, Dr. Perry, the founder of Curamericas Global, has lived and worked abroad in more than 15 countries implementing health care programs in an effort to stem children from dying of preventable diseases. This nonprofit has carried out community-based maternal and child health programs in Guatemala, Mexico, Haiti and Liberia, benefitting almost one million people over the past 30 years. He is a physician and currently Senior Associate in the Health Systems Program of the Department of International Health at the Bloomberg School of Public Health of the Johns Hopkins University. Dr. Perry received the Medical Award of Excellence. Kathleen and David Sparks. These owner/operators of 18 McDonald's restaurants in northern Indiana and southwest Michigan have supported children in their community through education, school athletic programs and the establishment of the local RMHC Chapter. Their work includes support of the Indianapolis Ronald McDonald House, and the development of a Ronald McDonald Family Room at Memorial Hospital. And to help raise awareness for the mission of RMHC, they co-chaired the 2005 McDonald's All American Games. In 2009, the Sparks were inducted into the South Bend Hall of Fame. The Sparks received the Gerry Newman McTLC Award of Excellence. "We are privileged to recognize these extraordinary individuals for their outstanding contributions," said J.C. Gonzalez-Mendez, president and CEO of RMHC. 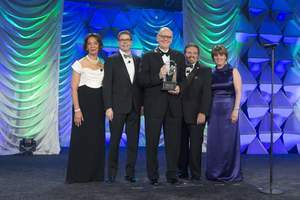 "Like RMHC, these award recipients are dedicated to supporting the critical needs of children so they can reach their full potential and live fulfilling lives." In addition to honoring these outstanding individuals, the evening's celebration included a silent auction, dinner and entertainment by Academy, Golden Globe, Grammy and Screen Actors Guild award winner Jennifer Hudson. The event raised $3.3 million to help RMHC provide stability and vital resources to help over seven million families annually focus on what's most important -- their child. Past RMHC Awards of Excellence Recipients have included: Jamie Lee Curtis (2012); former Mayor Richard M. Daley and Maggie Daley (2011); founder of Southwest Airlines, Herbert D. Kelleher (2010); seven-time NBA All-Star, two-time Defensive Player of the Year and founder of Alonzo Mourning Charities, Alonzo Mourning (2009); entrepreneurs and philanthropists, Peter and Ginny Ueberroth (2008); actress, producer, social activist and national outreach director for St. Jude Children's Research Hospital, Marlo Thomas (2007); NCAA championship basketball coach and youth mentor, John Wooden (2006); the Association of Hole in the Wall Camps with actor Paul Newman accepting on their behalf (2005); actor, director and humanitarian, Danny Glover (2004); renowned pediatric surgeon, Dr. Benjamin Carson (2003); Her Majesty Queen Noor of Jordan (2002); tennis star Andrea Jaeger (2001); performer and humanitarian, Harry Belafonte (2000); wife of McDonald's Corporation founder Ray A. Kroc, the late Joan Kroc (1999); Betty Ford, former First Lady (1998); Retired U.S. Army General, Colin Powell (1997); acclaimed theologian, Henri J. M. Nouwen (1996); former U.S. Surgeon General, Dr. Antonia Novello (1995); Barbara Bush, former First Lady (1994); the late Fred Rogers (1993); Eunice Kennedy Shriver (1992); former U.S. President, Jimmy Carter (1991); and the late Jim Henson (1990), among others. Ronald McDonald House Charities® (RMHC®), a non-profit, 501 (c) (3) corporation, creates, finds and supports programs that directly improve the health and well-being of children. Through its global network of local Chapters in 58 countries and regions, its three core programs, the Ronald McDonald House®, Ronald McDonald Family Room® and Ronald McDonald Care Mobile®, and millions of dollars in grants to support children's programs worldwide, RMHC provides stability and resources to families so they can get and keep their children healthy and happy. All RMHC-operated and supported programs provide access to quality health care and give children and families the time they need together to heal faster and cope better. For more information, visit www.rmhc.org, follow us on Twitter (@RMHC) or like us on Facebook (Facebook.com/RMHC Global). 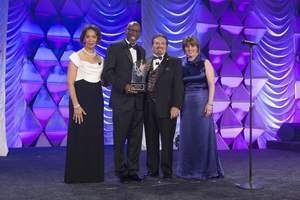 From left to right: Linda Dunham, chair of the RMHC Global Board of Trustees; David C. Herman, M.D., MSMM, Global Board of Trustee for RMHC; RMHC Medical Award of Excellence honoree, Henry B. Perry III, MD, PhD, MPH; J.C. Gonzalez-Mendez, president and CEO of RMHC; and Sheila Musolino, chief operating officer of RMHC. 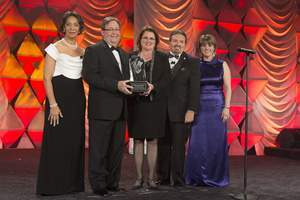 From left to right: Linda Dunham, chair of the RMHC Global Board of Trustees; David and Kathleen Sparks, McDonald’s owner/operators; J.C. Gonzalez-Mendez, president and CEO of RMHC; and Sheila Musolino, chief operating officer of RMHC. From left to right: Linda Dunham, chair of the RMHC Global Board of Trustees ; Geoffrey Canada, president and CEO of the Harlem Children’s Zone (HCZ); J.C. Gonzalez-Mendez, president and CEO of RMHC; and Sheila Musolino, chief operating officer of RMHC.